The delivery of three B777-300 ER planes is scheduled to be completed in February next year, with two expected to be bought in January. Out of three aircraft, two are to be acquired in January 2018 and those would be for the use of VVIPs, the official said. After making required modifications, the two planes would join the fleet that are generally used to carry President, Vice President and Prime Minister, the official added. 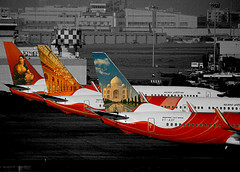 considering Air India is being considered for sale, which livery will they be sporting. Won't it be better to hand them over to IAF, considering they are already maintaining B737s. Boeing will deliver two brand new B-777 to Air India this month, which will be used as the next VVIP planes for being flown by the president, VP and prime minister on their medium to long foreign trips. Once retrofitted with state-of-the-art security and communication systems, these two will replace the over 27-year-old Boeing 747 jumbo jets which have flying our top VVIPs across the globe. Making these planes fit for this high security duty will take about a year. "The government is deciding who will operate these two B 777-300 extended range as AI, which as the pilots, engineers and expertise for operating this type of aircraft, is soon going to be sold off. A call will be taken if the Indian Air Force (IAF) should have the planes in its fleet with the required infrastructure," said a senior government official. So it remains to be seen if our VVIP plane is known as IAF 1 or AI 1. Till that call is taken, these planes could be sent to Boeing in US for VVIP retrofitting and high-end security fixtures like anti-missile systems apart from latest communication equipment so that they can serve as flying PMOs when the PM is on board. About two years back it was decided that post-modification, these planes will be handed over to IAF which would have then operated them with technical support of AI. Then there was a rethink on this as AI has the pilots, engineering and expertise for operating the Boeing 777s, and it was felt these aircraft should remain with AI once they are converted as VVIP jets. The old Boeing 747s being used today for long international flights by the PM are perfectly safe to fly but due to their advanced age, they are fuel guzzlers. They also cannot fly long-haul routes like India-US nonstop and do so with a stop in Europe. AI has four B-747s of which two are kept for VVIP flying. Air India is set to take the delivery of the first of the two B777 aircraft, which will be used to fly the VVIPs, on January 24. A team of pilots along with some senior ministry officials will be flying to the Seattle facility of plane maker Boeing via San Francisco on January 20 for this purpose, an airline source close to the development told PTI. The induction of the two Boeing 777-300ERs will replace the over 25-year-old jumbo jets, B747-400s - which are currently used to ferry president, vice president and prime minister. The new aircraft, however, will be put to use only around July-August as the planes will immediately be sent back to the US for retrofit after the completion of registration formalities, the source said. The retrofitting is expected to cost the nation around over Rs 1,100 crore. "A team comprising four pilots -- two senior commanders and two first officers -- along with some senior ministry officials will leave for San Francisco on January 20 from where they will fly to Seattle," the source said. They will fly back on 24 after taking the delivery and the new aircraft will arrive here on the eve of the Republic Day, the source said. "These planes, however, will go back to the US for modification, which will take at least six months to complete," the source said. Air India today took the delivery of its latest Boeing 777-300 ER aircraft, which will be one of the two new planes to be used for VVIP purposes. This aircraft is among the last three Boeing 777 aircraft remaining from an order of 68 Boeing aircraft placed by the national carrier in 2006. The plane took off from Everett in Washington at 12pm local time and landed in Delhi at 7.31pm, completing its journey in a "record" 14 hours and 10 minutes, according to Air India. Two more Boeing 777s will be brought by Air India in January and February, two of which will be used for VVIP purposes and one will be inducted into the fleet of the national carrier. Today's flight operated under a special number AI 160. The Boeing 777-300ER aircraft has been registered as VT-ALV. The planes meant for VVIP use will be retrofitted, and the disinvestment-bound Air India has sought loans worth over Rs. 1,100 crore for their modification. I bet *someone* rues the fact that "Gujarat" was already taken ! I expected they would be named "Dhokla" and "Khandvi" !! The Boeing 777 that will soon replace the ageing VVIP jumbo jets used by the president, VP and PM on long-haul journeys has created a record by reaching Delhi in the fastest time for any commercial nonstop flying from the west coast of US to India — just over 14 hours. Air India on Wednesday decided to fly the B-777 (VT-ALV) from Boeing's Seattle factory to India over the Pacific and Northern Russia, instead of the usual route it always takes over the Atlantic. While this routing normally has adverse headwinds, being shorter by almost 1,000 km and favourable winds that day led to AI operations department deciding on this way. As a result, the future VIP aircraft reached Delhi in just 14 hours and 10 minutes on Wednesday. Flying the Atlantic route takes anywhere between 15 and 16 hours. The record time taken by this flight has now led AI to contemplate flying its nonstop from San Francisco (SFO) to Delhi also on this route on favourable wind days, cutting the travel time from an average 16-17 hours of this popular flight — the only nonstop between India and west coast of US — to less than 15 hours. "We saved close to $6,000 in fuel and overflying expenses, apart from shaving off flying time, while bringing the B-777 from Seattle to India on Wednesday. We flew over Northern Russia. We may now take this route on SFO-Delhi sector when wind direction is favourable for flying west to India," said a senior AI official. On Delhi-SFO route, AI flies east over the Pacific and returns over the Atlantic. This is done to make use of favourable tailwinds — winds blowing in the same direction as the aircraft flying and making it go faster — all the way and save both fuel and time. Now AI SFO-Delhi may also be over the Pacific to cut expenses and flying time whenever wind flow direction is favourable for that routing. Apart from VT-ALV, AI is to get one more B 777-300 extended range (ER) this month which will be used as the next VVIP planes, replacing the over 25-year-old Jumbo Jets India's top dignitaries currently fly for long journeys. These planes will be retrofitted by Boeing with the most modern security and communication systems and are expected to be ready for use in less than two years. The future AI-1 or IAF-1 (depending on who maintains and operates VVIP aircraft once AI is privatised) has already created its first record by flying from Seattle to Delhi in just over 14 hours. "The plane has come with normal passenger seating. The modalities is being worked out if it goes for retrofitting right away; by whom, meaning AI or IAF; and if it could be used by AI for some time," said another official. Official cost of "Dhokla" and "Khandvi", revealed as part of the Union Budget 2018, in India. The second VVIP 77W, VT-ALW "Rajasthan", has been delivered to Air India today. I believe the cost is more of security equipment and less of the planes. Else two planes for that much is exorbitant. So the additional 1100 crore is for modifications other than security equipment ? maybe I am used to hearing about costs in $s. Modification deemed as "modification in their internal configuration" is USD 180M. So that makes it approx. 5600 Crore. India’s first set of brand new planes for the prime minister, president and vice-president will be customised and be ready for use by early 2020, senior government officials said. Two Boeing 777-300 ERs, bought by Air India recently, will be retrofitted to have VIP enclosures, a press conference room and a patient transport unit for medical emergencies. The aircraft will also be equipped with Wi-Fi on board and have anti-missile protection, a senior official said. A Boeing 777 unlike the older Boeing 747, which were borrowed from Air India as and when a VVIP visited overseas, can fly non-stop to the US, thereby dispensing with the need to halt for refuelling. In February and March, Air India inducted three Boeing 777 aircraft, completing an order of 68 planes placed with the aerospace major in 2006. Two of these three planes will be set aside exclusively for VVIP use. “The government will buy these aircraft from Air India,” a senior official told PTI on the condition of anonymity. An aircraft exclusively for VVIPs—such as the president, vice-president and prime minister—will mean that Air India will no more have to ground aircraft from its fleet for special flights and re-configure them to include VIP enclosures, a press conference room etc for these operations. Earlier, during the budget announcement for the next fiscal, the government had set aside an amount of Rs4,469.50 crore for the purchase of these aircraft from Air India. Officials in the know say that the amount would cover the cost of the plane, their retro-fitment, the cost of a spare engine as well as a special equipment box list or spare parts that need to be mandatorily onboard an aircraft. The two planes will return to Boeing’s facility in the US on 1 June and 30 June to undergo overhauling which will take 18 months. The Indian Air Force is also negotiating with the US government for a special protection suite or anti-missile protection for these planes, it is reliably learnt. Air India will prepare a pool of 44 pilots for VVIP operations, four of whom will always be on standby and stationed in Delhi. There will also be a dedicated team of engineers and cabin crew. To a question on how would privatisation of Air India effect deployment of pilots and cabin crew for the VVIP flights, a senior airline official said that the government is yet to finalise its decision on the matter. With cash-starved Air India on the selling block, the government has released funds from National Small Savings Funds (NSSF) for retrofitting two brand new Boeing 777 planes that will be used by future Indian Presidents and Prime Ministers for long haul flights. The two B 777-300 extended range (ER) planes were delivered to AI last month and will be sent to US where they will be equipped with ultra-modern communication and security systems, apart from ultra comfortable interiors. Once ready by 2020, they will phase out the over 25-year-old jumbo jets used by VVIPs currently. “Air India had proposed to seek a short term loan of $180 million (over Rs 1,100 crore) from Bank of Baroda which was selected by way of tender process for the modification of two B-777 ER aircraft allocated for special extra section flights (SESF) VVIP operations. However, this loan was not taken as the Government of India has released the required funds/amounts from National Small Savings Funds (NSSF) account for the payment towards both procurement and modification of these two B 777-300ER aircraft,” minister of state for civil aviation Jayant Sinha told Parliament on Tuesday, in reply to a query on whether AI had sought a loan of Rs 1,100 crore for modifying these two planes. “These planes will be used for SESF of Government of India. The cost of cabin reconfiguration is now estimated at $132 million for the two B777- 300ER aircraft. The original estimate was around $180 million,” Sinha said in his reply. The government is considering options over who will maintain and operate these two VVIP planes as AI is soon going to be privatised. At present, Indian Air Force operates and maintains a fleet of single aisle Boeing Business Jets for domestic and short international flights by top VVIPs. The two twin aisle B-777s may go the same way by having experienced AI personnel, like pilots and engineers, on board. “We are evaluating options. As of now, the two B-777s are part of AI inventory,” a top official said. 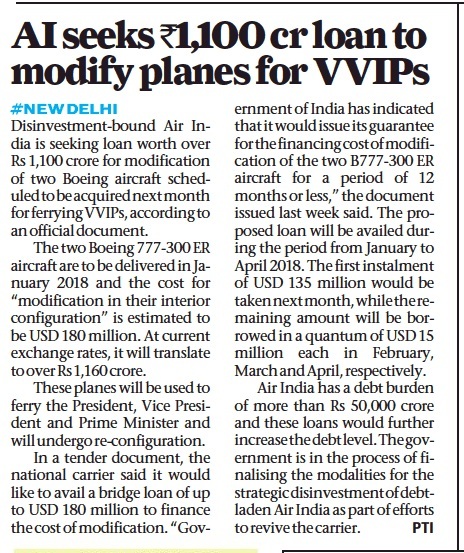 AI had last December issued a tender document to avail a bridge loan of up to $180 million to fund the modification of these two future VVIP planes. 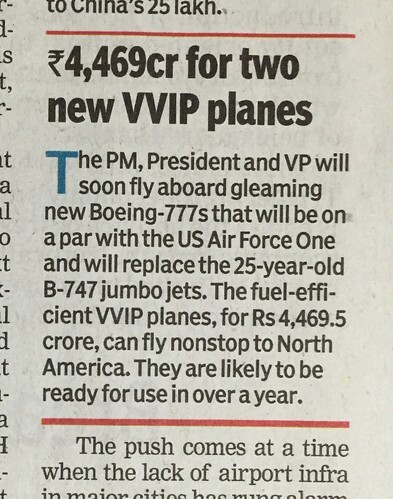 The Union Budget presented on February 1 had set aside Rs 4,469.5 crore for purchasing these two planes for VVIP use and retrofitting them with state-of-the-art security and communication systems that will bring them at par with Air Force One. AI has five B747s, over 25 year old, in its fleets that are maintained mainly for VVIP flights. The airline flies them on nearby international and some domestic routes. The airline will phase its trusted old planes once the replacement comes. The two planes that will replace them are part of the order for 50 Boeing wide body aircraft AI had placed in 2005. With cash-starved Air India on the selling block, the government has released funds from National Small Savings Funds (NSSF) for retrofitting two brand new Boeing 777 planes that will be used by future Indian presidents and prime ministers for long haul flights. The two B 777-300 extended range (ER) planes were delivered to AI last month and will be sent to US for having ultra modern communication and security systems, apart from ultra comfortable interiors. Once ready by 2020, they will phase out the over 25-year-old jumbo jets used by VVIPs currently. “Air India had proposed to seek a short term loan of $180 million (over Rs 1,100 crore) from Bank of Baroda which was selected by way of tender process for the modification of two B-777 ER aircraft allocated for special extra section flights (SESF) VVIP operations. However, this loan was not taken as the Government of India has released the required funds/amounts from National Small Savings Funds (NSSF) account for the payment towards both procurement and modification of these two B 777-300ER aircraft,” minister of state for civil aviation Jayant Sinha told Parliament Tuesday, in reply to a query on whether AI had sought a loan of Rs 1,100 crore for modifying these two planes. India is 18 months away from getting its first ever exclusive pair of VVIP planes as Air India’s brand new Boeing 777-300 ER aircraft left for the US on Friday morning to be overhauled for use by the President, Vice President and Prime Minister of the country. The plane will be modified to include VIP enclosures, a press conference room, on-board Wi-Fi, and a patient transport unit for medical emergencies, among other requirements. It will also have a special protection suite or an anti-missile system. “The plane has left for Boeing’s facility at Forth Worth, Dallas. Air India has entered into an agreement with Boeing to carry out retrofitment, which will be completed in 18 months,” said an official of the airline. Unlike the Boeing 747-400, which were borrowed from Air India whenever a VVIP had to make a foreign trip, a Boeing 777-300 ER can fly for nearly 20 hours non-stop, or as far as the US, and will not have to halt midway for refuelling. In February and March, Air India added three Boeing 777-300 ERs to its fleet, completing an order of 68 planes placed in 2006. Two of these three planes have been set aside for VVIPs. The second Boeing 777 aircraft will leave the country on June 30. The two planes will return to the country by the end of 2019, and will be deployed for VVIP flights from 2020 onwards, the official added. The two planes will replace the existing Boeing 747-400s, which are borrowed from Air India as and when a VVIP is scheduled to visit a foreign country, and have to be modified each time to include facilities like a conference room. These planes are nearly 25 years old and airline officials feel that, in the coming years, it would be difficult to carry out maintenance work and find spare parts for them. During the Budget announcement this year, the government allocated ₹ 4,469.50 crore towards the cost of the retrofitment, as well as spare parts, for the two planes. Meanwhile, AI's 777 fleet remains decrepit with respect to inflight comfors, outfitted with broken IFE, outdated seats, filth in certain quarters, duct tape holding paneling together, etc. But the babu/Neta/mantris must have their private 777s outfitted with the best. What a joke of a government. So much for Whatsisname's commitment to modernizing the nation. He's turned it into even more of a banana republic. Let's hope this phoreign travelling scumbag doesn't ever get to use "Dhokla" and "Khandvi" by the time they are ready (for the next lot of corrupt scumbags). I wonder why AI took delivery of these a/c with interiors when they were supposed to be converted for PM/President use. What happens to the interiors now? Do the seats replace the broken down seats in the older fleet two older a/c get entire interior replaced? I suppose AI Engineering would have stripped out all those bits to use as spares for their existing 777 fleet and sent the bare Airframes back to Boeing for conversion into VIP? Who knows? Probably sold by some AI staffers for a profit on the streets of Kalina. Take a stroll there on any day, and you can buy all sorts of AI paraphernalia, inflight amenity kits, blankets, pillows, crockery, cutlery, etc., etc., intended for paying passengers. I even saw PTVs pulled from the back of 777s for sale. God knows who would buy it, but I suspect it's some sort of internal racket where Employee A rips them out, sells it to some karkhana, who then sells it back to AI maintenance. I may be guilty of hearsay and conjecture and other sins, but the corruption in AI can be startling. Unlikely, VT-ALV flew a revenue flight to ORD as AI1127 so definitely the plane flew with all the interiors. AI is actually utilising its 'older' 77Ws and 77Ls very effectively. As for dedicating an aircraft for the President's or PM's junkets, it is actually a very good idea. It is better that a dedicated aircraft is provided, rather than leasing out AI's aircraft and cancelling their scheduled flights. Air India’s failed divestment bid has led to the government for now dropping the plan to transfer two of the airline’s Boeing 747s to Indian Air Force for VVIP use post the Maharaja going into private hands. AI has four jumbo jets which are used for long haul flights by top dignitaries like the president and prime minister. “Since it was felt AI was going to be sold off, the plan was to transfer two of the five B-747s to IAF which already maintain Boeing Business Jets (BBJ) for short haul flights of top VVIPs. However, that need did not arise with AI remaining unsold for now. The dignitaries’ B-747 flights will continue to be operated by the government-owned AI till a decision on the Maharaja’s future is taken,” said sources. The B-747s used by VVIPs are over 25 year old. AI earlier this year got two two brand new Boeing 777 which will be sent to US-based Boeing Defence for retrofitting with the latest security and communication systems and be ready for VVIP use in 18 months. The idea is to keep VVIP aircraft under a government agency like IAF which already operates the BBJs. Some personnel from AI like experienced pilots and technicians would have been taken from AI rolls to some other government unit. The first bid document issued for AI had said: “The four B747-400 aircraft are being used for VVIP flights on behalf of GOI (government of India). These arrangements would continue and the aircraft retained in the fleet till the two new B777-300ER aircraft procured by the GOI for this purpose are ready for operations. The operations and maintenance of the 2 new B777-300ER aircrafts meant for VVIP operations would have to be carried out by Air India. The details would be provided at the time of RFP.” However with no bid coming for AI, the RFP stage was not reached. “Air India had proposed to seek a short term loan of $180 million (over Rs 1,100 crore)… for the modification of two B-777 ER aircraft allocated for special extra section flights (SESF) VVIP operations…. These planes will be used for SESF of Government of India. The cost of cabin reconfiguration is now estimated $132 million for two B777- 300ER aircraft. The original estimate was around $180 million,” the aviation ministry had recently told Parliament. The US State Department on Wednesday approved the sale of self-protection equipment to India for use on two Boeing 777 aircraft that are being modified for VIP transport purposes. The self-protection equipment, which are called Large Aircraft Infrared Countermeasures (LAIRCM) self-protection suites, will cost around $190 million. The LAIRCM system consists of sensors, electronic warfare equipment and high-energy lasers, which work in an integrated manner to protect the host aircraft from 'heat-seeking' missiles that home in on a target's infra-red signature. Similar equipment is used on the two Boeing 747 aircraft that carry the US president and are referred to by their call sign 'Air Force One'. The US State Department's approval for the LAIRCM equipment for India will now need to be formally cleared by the US Congress, after which commercial negotiations with New Delhi will begin for a sale to be concluded. The two Boeing 777s, which will carry the president, vice-president and prime minister, will have features such as VIP enclosures and press conference facilities as well as missile protection. The two aircraft, being modified in the US, are expected to return to India by the end of 2019, according to reports. The prime minister, president and vice-president currently use Boeing 747 aircraft from Air India for trips to distant overseas locations. Unlike the Boeing 747, the Boeing 777s being modified for VIP service can fly up to 20 hours without need for refuelling and can fly non-stop to the US. An "irked" Central Information Commission (CIC) issued a show-cause notice to Air India's CPIO on Thursday for the "callous attitude" while denying information about the purchase price of Air India-I aircraft to ferry VVIPs like the president and the prime minister. 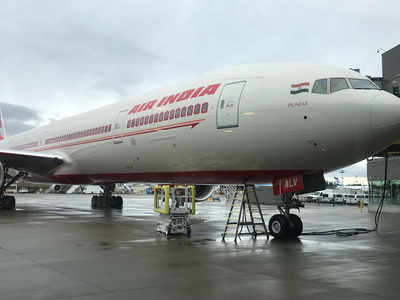 The national carrier, while denying an RTI applicant the details of the cost and status of the purchase of Boeing 777-300, to be used as Air India-I, did not invoke any of the RTI exemption clauses in an "inordinately delayed" response, Information Commissioner Divya Prakash Sinha noted. When the matter came up for hearing before the CIC, the Central Public Information Officer (CPIO), the nodal officer for handling RTI applications in a public authority, of Air India was not present. He had, instead, delegated it to a different officer, who was caught unaware about the reasons for the delayed response. Under the RTI Act, a response to an application should mandatorily be provided within 30 days. The information could only be denied citing a suitable exemption clause under the RTI Act and "not merely on apprehensions and conjecture", Sinha noted.